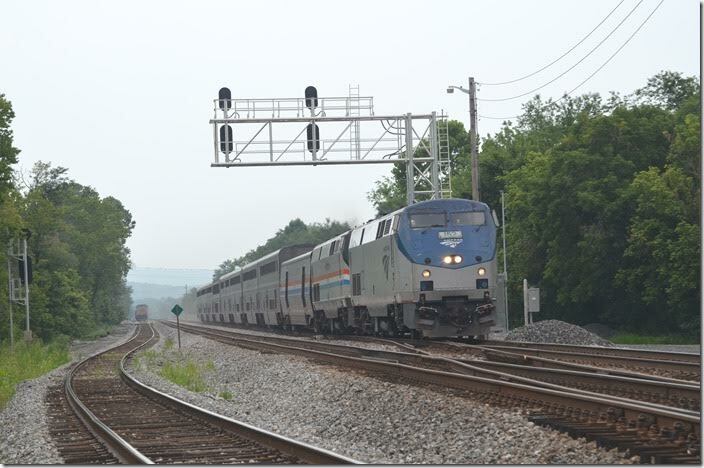 Between programs and seminars at the C&OHS Convention in Cumberland MD, Herb Parsons and I drove a few miles east of town to Green Spring, Green Spring in on CSX’s Cumberland Subdivision which used to be the B&O main line. To get across the Potomac from Maryland you cross a small toll bridge. The attendant waves a cup on a rod out the window, and you drop in a few coins. I don’t know which states gets the toll...maybe the bridge is private. 1. Q136-27 was leaving Cumberland as we were, but we beat him to Green Spring. 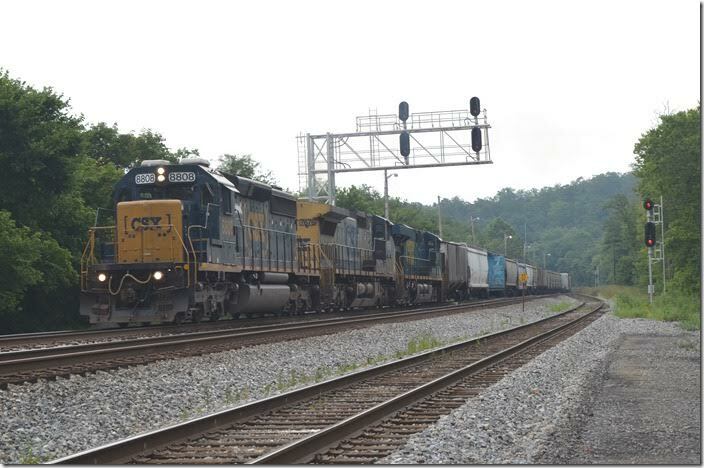 Today’s single stack train (North Baltimore OH to Portsmouth VA) has CSX engines 3354-5373. Green Spring WV. 2. 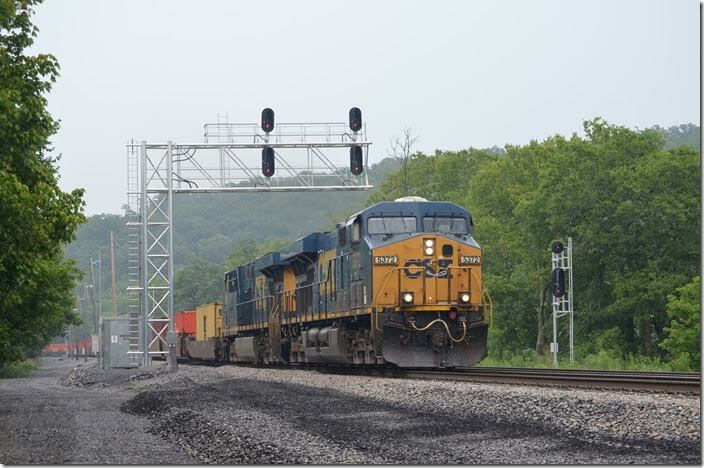 CSX 3354-5373. Green Spring WV. View 2. 3. 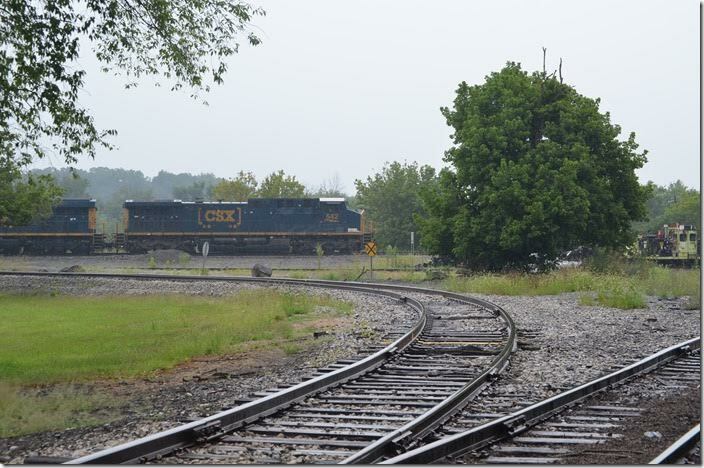 CSX 3354-5373. Green Spring WV. View 3. 4. 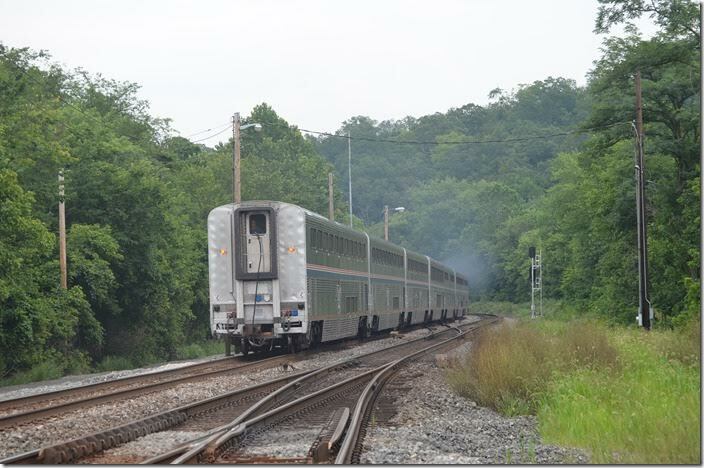 Amtrak’s Capitol Limited is fast overtaking Q136 on No. 1 track. 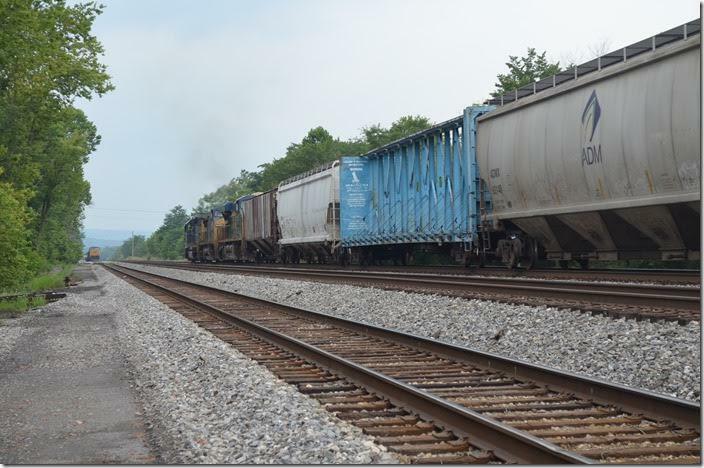 That’s a dead coal train parked in the east siding. Amtrak 152-822. Green Spring WV. 5. Amtrak No. 30 is due out of Cumberland at 9:20 AM. It is now 11:20 AM at Green Spring (14 miles east of Cumberland), so it is running an hour or so late. P030 has 9 cars. Amtrak 152-822. Green Spring WV. 6. Amtrak 152-822. Green Spring WV. View 2. 7. P030 will cross back to No. 2 Track at Okonoko ahead of Q136. The speed signs here are 40 for passenger and 35 for freight. Amtrak 152-822. Green Spring WV. View 3. 8. 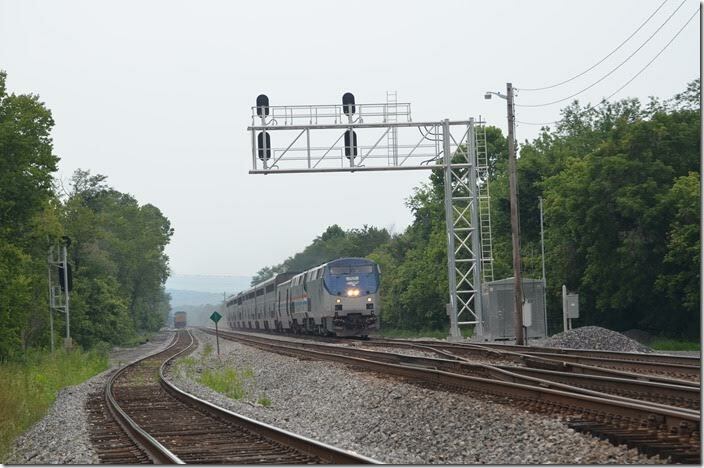 A westbound is waiting at Okonoko, and now he has the signal at Green Spring. 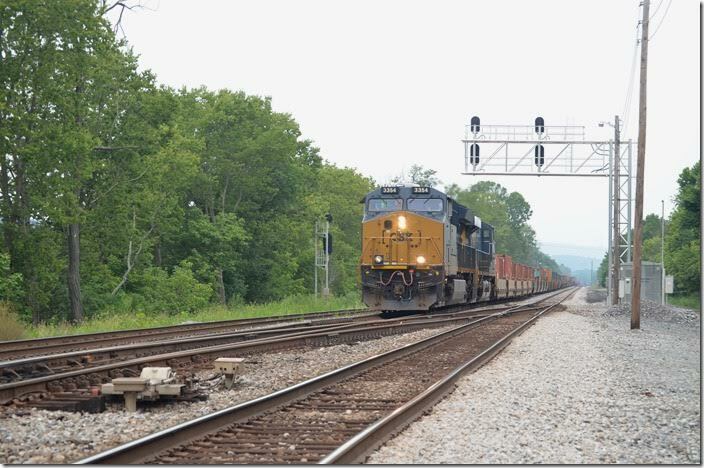 CSX clear signal Green Spring WV. 10. 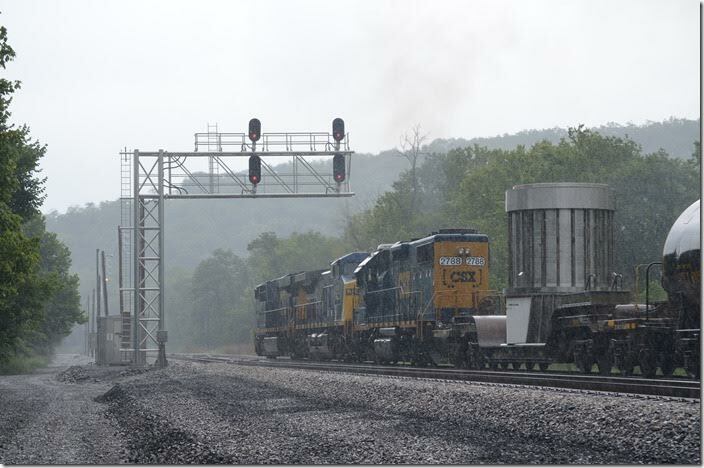 CSX 8808-7676-5335. Green Spring WV. View 2. 11. 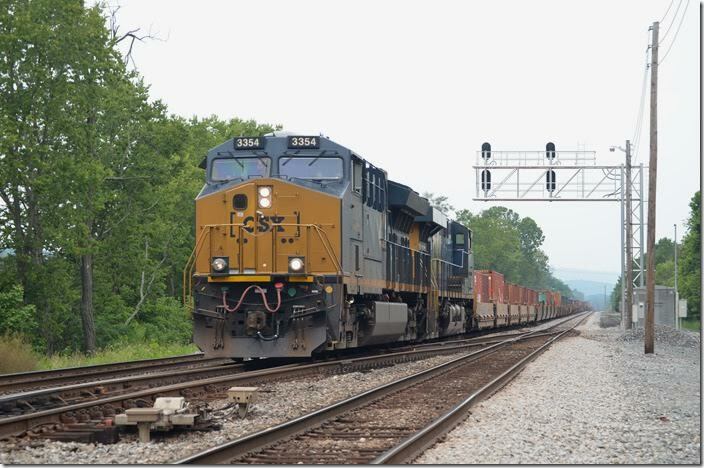 CSX 5372-5364 have w/b Q135-27 (Portsmouth VA – North Baltimore OH) with single stacks. Green Spring WV. 12. 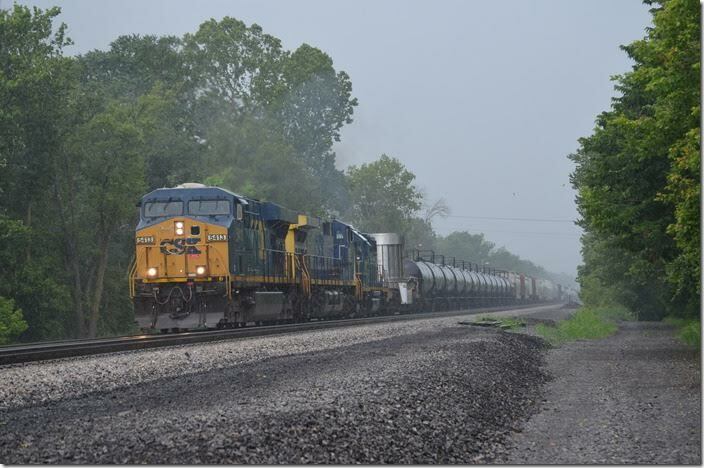 CSX 5372-5365. Green Spring WV. View 2. 13. 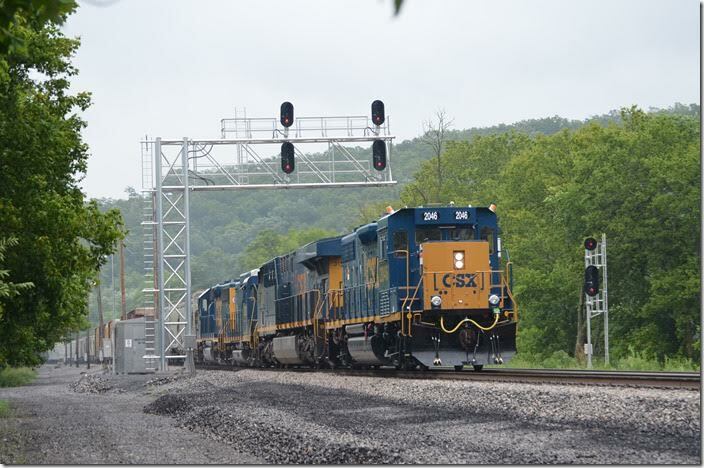 CSX 542-843 are parked on the east siding with coal train N786-25 (Monongahelia County Mine to Curtis Bay). Mon County is the old Blacksville 2 Mine. It was acquired a few years ago from Consol Energy by Murray Energy. In the Foreground is the wye to the South Branch Valley Railroad. Green Spring WV. 14. 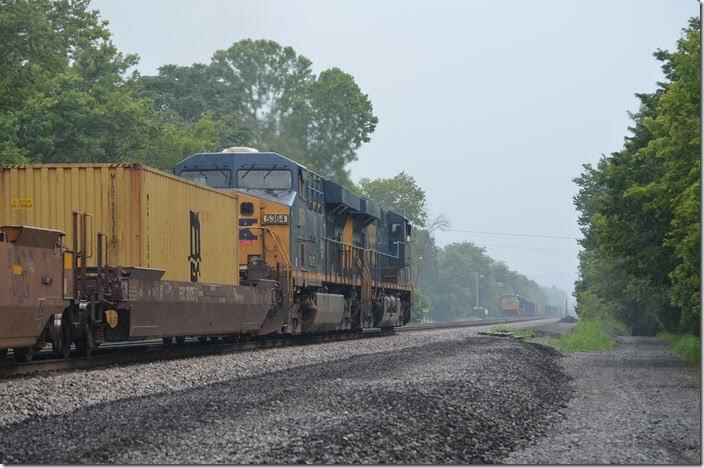 CSX “GP38-3” 2046 with 3159-2272-6479 hustles 51 cars of D787-28 (Cumberland-Brunswick local) west. No. 2046 was rebuilt from an older GP38-2. Green Spring WV. 15. Thunder crashes! Lightning flashes! 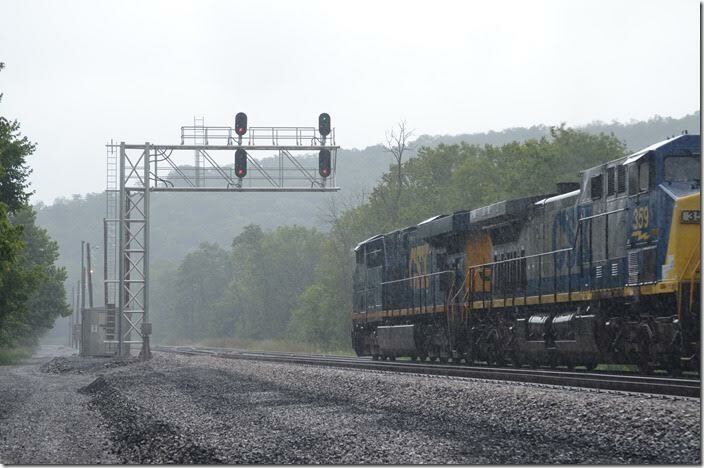 Herb and I jump out in the deluge to get CSX 5413-359-2788 plowing east with 115 cars of Q401-28 (Cumberland-Hamlet NC). Clear signal. Green Spring WV. 16. 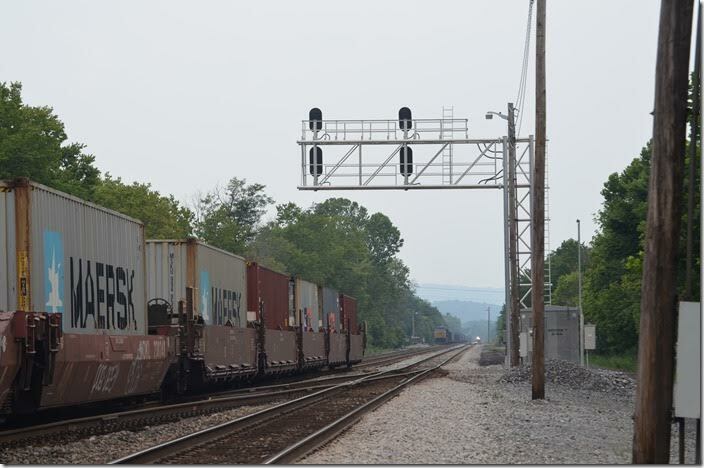 CSX 5413-359-2788. Green Spring WV. View 2. 17. 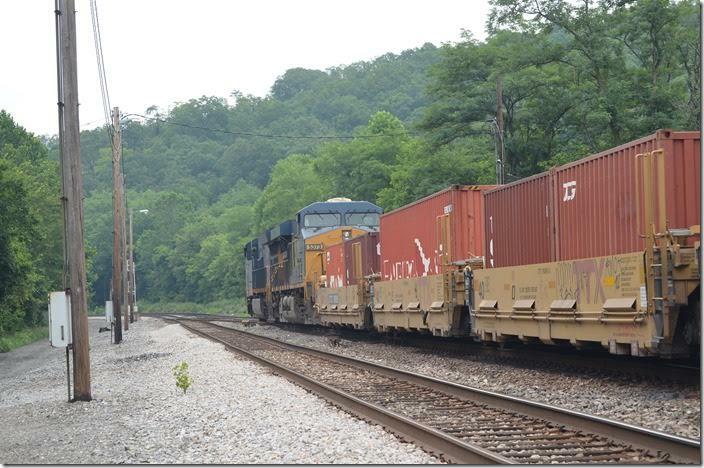 CSX 5413-359-2788. Green Spring WV. View 3. Having had good luck with action, we head back to the hotel for the afternoon’s activities. 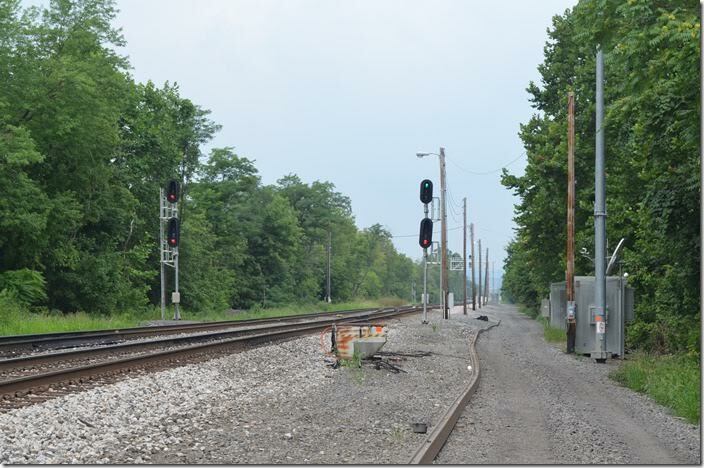 B&O had a tie treating plant at Green Spring between the main line and the river. Koppers later operated it, but it appears to be shut down now.